Next time you pay $10 for a “gourmet” or “premium” chocolate bar, ask yourself, are you really getting your money’s worth? The rapidly expanding gourmet chocolate market has created a disparity between price and actual quality, so many consumers are simply paying more for the same quality of mediocre chocolate that is marketed as “gourmet,” master chocolatier Pat Karpowski of the Chocolate Grape said. “There is not a definition for gourmet chocolate. Gourmet is more of a subjective perception. Usually the packaging denotes a higher quality of chocolate. It depends on how it is marketed,” said Susan Fussell, senior director of communications at the National Confectioners Association [NCA]. According to a study conducted by Mintel International, a market research group, over 42 percent of chocolate eaters buy some type of premium chocolate and this number is growing. In 2007, premium chocolate sales rose 28.5 percent, making a profit of almost $2 billion. “Manufacturers have made more products available so consumers are finding gourmet chocolate in more outlets. They are becoming more comfortable with it so they are seeking it out more,” Fussell said. In Europe, premium chocolate is known as couverture chocolate, which is chocolate made with a minimum of 32 percent cacao butter. However, in America, chocolatiers do not have to distinguish between the percentage of cacao butter and cocoa mass. “The percentage of cacao refers to the total, but the amount of cacao butter will vary, which will completely change not only the taste but the texture of the product. The higher the cacao mass content, the higher the antioxidant properties the chocolate will have,” Fussell said. Chocolate made from single origin cacao beans are more expensive because they are made from beans from a single country, giving the chocolate a distinct flavor profile. However, according to Christopher Curtin, the master chocolatier at Éclat Chocolate, a high-end chocolate store in Pennsylvania, single origin does not guarantee quality. Producers also charge more for organic chocolate. The problem with organic chocolate, however, is that quality is often sacrificed, Curtin said. Also industry standards on what is considered “organic” is vague. Many producers are also putting the percent cacao on their labels. This percentage refers to both the amount of cacao mass (which gives chocolate its flavor) and the amount of cacao butter. To Curtin, the amount of cacao butter does not add, but often takes away from the flavor of chocolate. “Quality mostly depends on how much cocoa butter and cocoa mass is in the chocolate. It can still taste awful but usually that’s a sign of a better tasting [chocolate], unless they haven’t taken care of the beans or the fermentation process,” Curtin said. High-end chocolatiers such as Valrhona, DeLafée, and Knipschildt sell their artisan chocolate for $40 – $90 per pound. 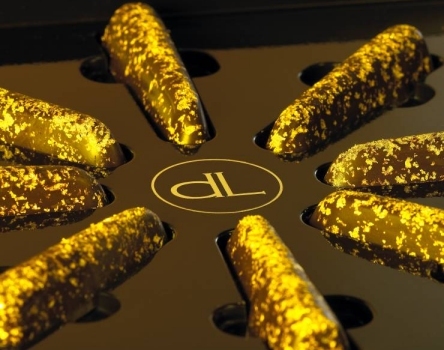 Knipschildt even offers their customers a truffle called La Madeline au Truffe for $2,500 a pound and DeLafée offers chocolate decorated with edible 24 karat gold for $508 a pound. “Some of the price difference may have a little to do with different tastes, but a good portion of it boils down to marketing. If you buy a Lindt bar and a Valrhona bar and put the two together you won’t be able to tell the difference,” Karpowski said. Some consumers admit the differences in taste may actually be from the price they have paid. “Gourmet chocolate is more satisfying probably because it costs so much,” said 62-year-old Lake Country resident Mike Mulherin. As the gourmet chocolate market expands, mass chocolate producers are not only buying out high-end chocolate companies, they are also creating their own brands of premium chocolate. “I think this will dilute the quality of the chocolate because large companies operate by different values. I fear that they will lose the attention to detail,” Mulherin said. High-end franchises such as Vosges Haut-Chocolat are also gaining popularity; however, their products are not made onsite as they are in local chocolate shops. Despite the lack of standards in what gourmet chocolate is, consumers say they will continue to purchase these chocolates. “When you have a taste for chocolate the only that that will satisfy it is chocolate, and gourmet chocolate is just more satisfying,” Mulherin said.